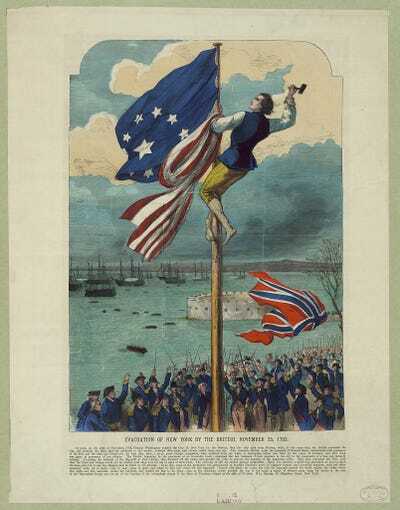 Library of CongressPrint showing a man on a flagpole replacing the British flag with an American flag as the British fleet departs New York Harbour. If you asked a New Yorker, or anyone from the Northeastern Seaboard for that matter, 150 years ago if they were excited for Thanksgiving you would have received a blank stare. Instead, that individual would likely be quickly preparing for the major late-November holiday of the time: Evacuation Day. Prior to President Lincoln’s establishment of Thanksgiving as an annual national holiday — a decision that followed the Union victory at Gettysburg in an attempt to foster national unity — Thanksgiving simply did not exist as a standard celebration. States and communities within the Northeast celebrated the idea of giving thanks, but it was never a widespread national event linked to a certain day, as it is now. Instead, November 25th was a day for national celebration for a vastly different reason. On November 25, 1783 the last British troops withdrew from Manhattan, signaling the end of the Revolutionary War. But as soon as British vessels raised sail, patriots did their all to remove it and replace it with the Stars and Stripes. Wooden cleats were quickly cut and nailed into the pole. 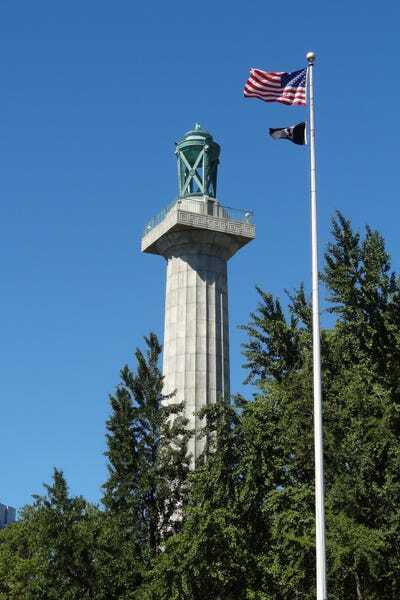 Despite the grease, Continental Army veteran John Van Arsdale managed to clamber up the pole and rip down the flag while the British were still in view of the harbour. In retaliation, the British fired a single cannon towards crowds lining Staten Island, but the shot fell short. The celebration of Evacuation Day continued until the lead-up to World War I, as a secular feast featuring plentiful amounts of food and liquor. The completion of the holiday was a competitive reenactment of clambering up an oiled pole to rip down a British flag. Adolph Alexander WeinmanThe Prison Ship Martyrs Monument in Fort Greene park, Brooklyn carries the remains of those who died about the British prison ships. As relations with Britain warmed — and perhaps because the US and Britain were such close allies in World War I — interest in Evacuation Day was quickly subsumed by Thanksgiving. But Evacuation Day should at least be brought back into the public conscience. Not because of any lingering ill will towards the British, of course. But rather because it’s aa celebration, in properly unique fashion, of a newly established United States. Along with the celebration of kicking out the British, Evacuation Day also serves as a poignant reminder that Americans died trying to free Manhattan from British rule — a place that’s now the site of the US’s greatest and most iconic city. Over 10,000 Revolutionary soldiers and sailors perished aboard British prison ships in Brooklyn’s Wallabout Bay (near the present-day Brooklyn Navy Yard) during the seven year British occupation of the city — a total that exceeds the number of soldiers killed in battles throughout the war. By celebrating Evacuation Day, the US can help remember these thousands of early American patriots, and commemorate the end of America’s founding conflict.